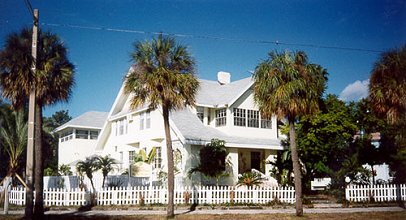 The Vinoy House is the only Bed and Breakfast directly in the water-front district of downtown St. Pete. No other B&B in the area has a better location. Plays, concerts, and holiday celebrations are held literally outside our front door. Our warm Key West style decor and Jimmy Buffet atmosphere make it the perfect "non-stress" getaway designed for both business and pleasure. Our common areas consist of two large living rooms, two fire places, a game room with bar, billiards table, dart board, and fuss ball table. Also enjoy a restaurant style dining area, a sun-room with snack bar and movie center, and a beautiful tiled porch and patio facing the waterfront park. Other features include an in-house message therapist, on site parking, boat rides with advance reservations, bicycle, canoe, and fishing pole rentals. This and other St Petersburg Bed and Breakfast Inns can be found here in The Register. Romantic Country Inns, Getaways and B&Bs offer a great Saint Petersburg lodging alternative to big hotels.